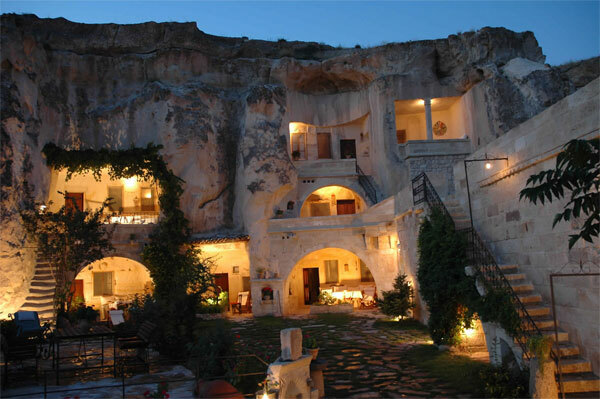 Cappadocia Elkep Evi Cave Hotel is a complex of three 7-room bed and breakfast pensions and a 2-bedroom suite clustered together and managed jointly to maintain the intimacy of a small hotel in Cappadocia. The hotel offers cave rooms with modern facilities ideally located near the top of Esbelli, the hill above the town of Urgup in Cappadocia. Prices include daily Turkish breakfast at Hilltop, in the garden or salon. Most rooms include a private terrace with panoramic views of Cappadocia overlooking the town of Urgup and the adjacent Goreme National Park. Hotel rooms are en suite, with wood floors, central heating and direct dial telephone. Boutique Hotel services include daily breakfast and housekeeping. Free extras: CD-player, electric waterboiler with different teas and literature in different languages. Laundry service, fax and internet access are available. Enjoy your daily breakfast and an unparalleled view of Cappadocia from the garden at Hilltop. The traditional Turkish breakfast includes home-made gozleme (a savoury Turkish pastry), olives, cheese, fresh bread, an assortment of jams, freshly squeezed orange juice and tea or coffee. Hotel Dinner can be served in the garden upon request. The hotel is located in the town of Urgup on the edge of Goreme National Park in the central Anatolian tableland known as Cappadocia. Goreme National Park and the rock sites of Cappadocia were inscribed on the list of World Heritage Sites as a mixed property of both cultural and natural significance with the UNESCO World Heritage Center in 1985. By air: One hour plane ride from Istanbul to Kayseri. Less than one hour drive to Urgup. By car: Eight hours from Istanbul to Ürgüp or 3.5 hours from Ankara. By bus: Overnight bus (10 hours) from Istanbul to Ürgüp or 4 hour bus ride from Ankara. Coming from Ürgüp town centre and bus station (“Centrum”): Take the road to Nevsehir for 5 minutes, turn right after the Turasan Winery, 200 yards up the hill (bearing right) to Elkep Evi cave Hotel. Walk through vineyards and fruit orchards surrounded by the surreal Cappadocian landscape to centuries-old Christian monasteries, cave churches and chapels on your own or with a guide to explain the Byzantine iconography still found on many of the cave walls or Cappadocian legends and customs. Or stroll around the hilltop behind the hotel for a 360 degree panoramic view of Cappadocia. Excursions to the Goreme Open Air Museum, Ihlara Valley, Soganli, Zelve, Cavusin and Derinkuyu to name just a few of the more famous sights of Cappadocia, can be arranged by the hotel. Glide silently over the Cappadocian landscape, including Love Valley, and skim the tops of apricot trees at dawn.You will be greeted with a glass a champagne upon your return to land after this most exhilarating experience. The local hamam in Ürgüp serves both men and women in a historical building. Treat yourself to a luxurious soaping, steam bath and massage after a hard day of walking. Cappadocia covered in snow presents a different landscape. If the snow is too deep for walking, we can arrange the 1.5 hour drive to the Mt. Erciyes (Mt. Argeus) ski resort outside Kayseri. Children less Than 6 years old are free of charge! All rooms have en suite bathrooms, direct dial telephone, French or twin beds. The above rates are on bed & breakfast basis per night and include applicable taxes and surcharges. If you pay cash on your departure from hotel, you will have 15% discount.